Welcome to my website. My name is Annette Ellis and I am a Level 5 qualified Clinical Reflexologist. I offer a clinical reflexology service specially tailored to suit each individual client and their particular needs. I am also trained in Reiki and Indian Head Massage. All of the products I use are 100% vegan and certified not tested on animals. I am based in Talbot Green which is close to M4 junction 34. There is plenty of car parking space nearby as we are located directly opposite Llantrisant Retail Park, a minute’s walk from Talbot Green bus station providing excellent bus links from locations including Tonyrefail, Cardiff, Llanharan, Llanharry, Caerphilly, Church Village, Pontypridd and Bridgend. 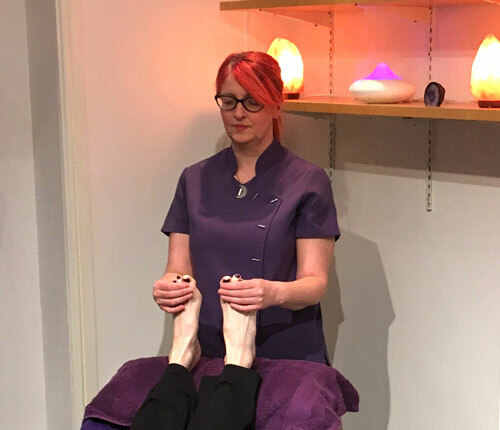 Reflexology is a holistic therapy based on the theory that different points on the feet, lower leg, hands, face or ears correspond with different areas of the body. It is most commonly performed on the feet. Reflexologists use their fingers and thumbs to exert gentle pressure on specific points on the feet. As a result treating the feet can have a relaxing and healing effect on the whole body. Would you like to book a treatment? If so why not contact me by email or telephone or by using the online contact form? Annette Ellis Reflexology shared a post. Annette is very thorough before session in finding out about everything and making you feel at ease and explaining what she will be doing...I really enjoyed and benefited from my 1st session, very relaxing and Annette sat and talked me through what she picked up on and what we will be doing in future sessions to help my problem areas...the drainage technique has really helped reduce the swelling in my "elephant ankles"docs have always put this down to my illness? 1 session and both myself and others seen a difference in the swelling! no more steroid injections just reflexology for me...next session we are combining Indian head massage as well 🤗cannot wait. Annette Ellis Reflexology shared a photo. Annette Ellis Reflexology shared a live video.